Keywords: Carpet Cleaning Steam Repair Flood Damage Clean Up Residential Commercial Hays County Texas San Marcos New Braunfels Wimberley Buda Kyle Allergens Dust Mites Truckmount Certified Cleaning. Copyright 2007 is the owner of the copyright for this website. The web server used by Certifiedcarpetcleaning.biz is located in Houston, USA and is run by CyrusOne LLC. On this web server 49 other websites are hosted. The language of those websites is mostly english. 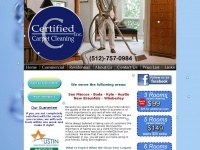 A Nginx server hosts the websites of Certifiedcarpetcleaning.biz. To analyze the visitors, the websites uses the analysis software Google Analytics. Indexing the data of the website and following hyperlinks on it is explicitly allowed by robot information.